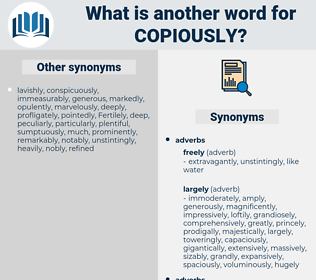 What is another word for copiously? unequally, insufficiently, inadequately, unsuitably, unsatisfactorily. heartlessly, poorly, grudgingly, stingily, selfishly, coldly, sparingly. Behind this mountainous structure was the altar, lighted copiously by the original east window. Miss Prissy always cries copiously when he gets to the place where she gave him a flower when he had walked home with her - she only fourteen years old and in short dresses - and which he wore in battle in his pocket Bible.